Photographs of the original OTHER-1 logic drawings related to the implementation of the Core Memory are presented here. The drawings were done with pencil on tracing paper with orange grid lines Though most had the grid on the reverse side, black and white copies were still hard to read, so the photos help a lot. Usually a drawing was done following the implementation using design sketches and prepared wiring lists and limited static testing with power applied. A Xerox of the drawing was made, and any subsequent red-line changes were made to the copy and the wiring lists, but not to the original tracing. Not many red-lines were necessary, and the only modifications to the originals here are to the Inhibit Drivers Logic and the Read / Write Control Logic drawings. 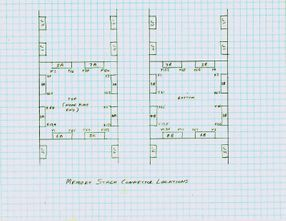 All of the Core Memory and some of the CPU logic circuit drawings also appear on this page. Explanatory tables and diagrams related to the logic drawings will appear on this page only. There are about 50 logic circuit drawings for the OTHER-1, some multi-sheet. 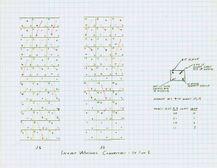 On the Memory board drawings, each rectangle depicting an IC location is marked the IC type (e.g. 74155), and typically (except the Inhibit Drivers Board) the number of pins (14, 16, 24), and unused logic gates in the IC (usually 0). Along the bottom, the general purpose of each group of ICs is indicated, and loosely relates to the name of the associated Logic diagram. See IC Reference page for links to IC datasheets. On a typical Logic Circuit Drawing, each used logic component is separately depicted, regardless of of how many such components are in the same IC package. The symbols used for the logic components are usually those appearing in the IC maker's handbook or data sheets (typically Texas Instruments). Off-diagram connections are labelled: the label name indicates the True or Active sense of the signal: an over-score on the name indicates the signal is True or Active when logical "0" or "low" (0 volts), lack of the over-score indicates True or Active when logical "1" or "high" (3 volts). Each logic component symbol will contain a number+character label inside (e.g., "5T") indicating the coordinates of it's containing IC on a Board Layout. (Other notations inside the symbol are generally those of the IC maker. I have marked some logic symbols "OC" to indicate an open-collector output.) Around the outside of the symbol, at the wiring connection points, are the IC pin numbers used for this logic component. Several logic components sharing the same IC package will have the same IC coordinates label, but will have different pin numbers. Connections across a multi-sheet drawing are labelled and the connections drawn with arrows: "-->" or ">--". The "A (X or Y) Core Drivers", "B (X or Y) Core Drivers, and "Inhibit Drivers" logic circuit drawings are atypical, in that they show a representative circuit that is actually repeated, based on associated Tables providing additional IC position and wiring information. See the sections (below) on these drawings for more detail. The Memory Data Register (MDR) is the interface buffer for data moving between the CPU and core memory. 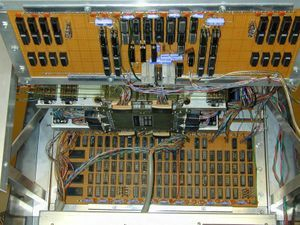 It is one of the eight 16-bit data registers in the CPU, connected together by three data busses. - MDR data is output to Inhibit Drivers for write to memory: (low) signals MDR BIT 0 thru MDR BIT 15 into Inhibit Control drawing multiplexers at 1T, 3T, 5T, and 7T. - MDR data is input from Sense Amplifier data buffers after read from memory: (low) signals MEMR0 thru MEMR15 from Sense Amplifiers / Read Buffer drawing. The Address Register (AR) is the interface buffer for addresses, specified by the CPU, of data to be read or written by the core memory. - The 12-bit AR address output always available at the core memory X-Y Drivers via six 74155 decoders shown on the Core Driver Select drawing (just below). - Redlines to a copy of this drawing show that I later added 2 latches (at 3K) and buffers (at 4K) to handle input bits C2, C3, and output bits B2, B3, using existing control signal "AR IN(4-5)" at gate output 1F4. My design intent was to initially address 4096 (4K) words of the Spectra 70 core stack, with an option to expand the addressing to 16K words later, implementing only partial initial support for 16K. The largest address needed in AR to address 4K is 7777 (octal), which sets AR4-15 to ones. AR2-3 would be used to address to 16K; since I never actually expanded core stack use from 4K to 16K, AR2 and AR3 are always 0, and the decoders at 10N and 16N are not needed. The Core Driver Select logic converts the 12 bit address from the AR into two pairs of core driver selection signals: 6 bits to the pair for the X drivers, and 6 bits to the pair for the Y drivers. Each pair of 16 selection signals is divided into two equal parts: 8 for selecting one of eight drivers for the A-side (labelled side) of the core stack, and 8 for selecting one of eight drivers for the B-side. As described in my Byte article, the Spectra 70 stack consists of 128 (Y) by 136 (X) words by 18 bits/word. Each of the 18 bit planes is organized into four 64 x 68 bit quadrants with four sets of sense lines (loops) parallel to the Y select lines, one set per quadrant. I used 64 by 64 words from one quadrant. There are also 8 inhibit lines per bit plane, parallel to the X select lines. The X and Y select lines are brought out to double-side PC board edge connection fingers on either end of the stack (connectors 1A-8A, 1B-8B). J1-J4 are for the inhibit lines, J1-J2 are for the sense lines. Compare with photo above, which shows the X-Y Drivers board tilted up (bottom row S towards camera). The A(X or Y) Core Drivers Logic drawing is shown to the left. The "A" in the name means that these drivers connect to the X or Y select lines at the top (side with the manufacturer's label) of the stack; the "B" drivers connect at the bottom of the stack. Note that the "16K only" components and table entries at "N" and "L" are not implemented. The drawing shows a representative core driver at "S" and diode arrays at "M" and "P". The table expands on this view, showing that there are actually four X core drivers (at 4S, 3S, 2S, 1S) and four Y drivers (at 22S, 23S, 24S, 25S); similarly for the diode arrays. Continuing the the example for the "COL 4" entry case, the 8 X memory drive lines (0 thru 7) connecting to the diode array pins (2 3 4 7 8 9 11 12) at 4P, and the X memory drive lines (8 thru 15) connecting to the array at 4M are obtained. Note that the Y drivers will have "Y" Core Driver Select names , and that Y drive lines assignment numbers to the Y diode arrays are identical to those given to the X diode arrays. The B (X or Y) drawing at the left shows the "B" core drivers, which connect to the bottom of the core stack. Note that the "16K only" components and connections shown in the table are not implemented. The drawing shows two representative core drivers at P and N, and two representative diode arrays at M and L: Similar to the method used for the A drivers, this drawing table expands the view to show four X drivers (at 9P, 9N, 8P, 8N) and four X diode arrays (at 9M, 9L, 8M, 8L) , four Y drivers (at 17P, 17N, 18P, 18N), and four Y diode arrays (at 17M, 17L, 18M, 18L). Signal names are built for B as for the A drivers above: in the "COL 9" entry, for example, "a n m" = "X 0 0" builds the signal name (low) BX00 at the 9P driver, pin 3; "a n m" = "X 0 1" builds the signal name (low) BX01 at the 9P driver, pin 14. The table Drive Line area shows that two select lines are wired to each diode array pin: continuing the "COL 9" example, B X core stack select lines 0 and 8 connect to diode array 9M pin 2, lines 16 and 24 connect to 9M pin 3, etc. As for the A drivers drawing, note for this B drawing that the Y drivers will have "Y" Core Driver Select names , and that Y drive lines assignment numbers to the Y diode arrays are identical to those given to the X diode arrays. The line selection scheme used for the X lines and the Y lines is a direct extension of the scheme illustrated in my July 1976 Byte Magazine article "Coincident Current Ferrite Core Memories," page 15, Figure 17, expanded as outlined in the Linear and Interface Circuits Data Book for Design Engineers by Texas Instruments, 1973, pages 10-32 thru 10-35 (Type SN75325 Memory Drivers Typical Application Data). - To address a word in 4K memory, only one of 64 X lines is to be selected. - In Core Driver Select circuit, 3 bits of address selects one of AX00 thru AX07 lines, and another 3 bits selects one of BX00 thru BX07. - So there are 8 * 8 = 64 unique ways of pairing AX to BX outputs. - (low)AX00 and (low)X READ activates AX core driver 4S output pin 2 and thus diode array 4P, which includes a connection to core drive line 5 at pin 9. - (low)BX05 and (low)X READ activates BX core driver 8P output pin 10 and thus diode array 8M, which includes the connection to core drive line 5 at pin 4, but no other lines of A X diode array 4P. After wiring all the X and Y select lines from the stack to the line drivers, I realized that I had wired all the stack X select lines to the Y drivers, and the Y select lines to the X drivers, and that the error was in the wire lists I had prepared. For a while I was really irked at this state of affairs, but eventually decided to leave the wiring in place since the stack select lines and and X-Y core driver logic was entirely symmetric with respect to X and Y. Besides, it wasn't like I would ever have to explain this confusion to anyone... (except for the matter of inhibit driver banks - see just below). The core stack has 144 inhibit windings coming out to 4 connectors (J1 thru J4 on connector map above), or 8 windings for each of the 18 bit planes. I had been using the Select Line (Fig 12), Inhibit Line (Fig 13), and Sense Amplifier (Fig 14) test circuits of the Byte article to discover the core stack organization, but the inhibit winding layout proved to be too mysterious for this approach to be very efficient in sorting things out. I needed to find out how the windings were distributed in a bit plane and which ones served the 4K quadrant I was using, how the windings segments were mapped to core select line ranges, and the current direction in each winding needed to result in inhibit action. Needing more functionality to proceed, I implemented the X-Y Driver logic and Sense Amplifiers as described on this page, and using the Read-Write control logic presented in Fig. 15a of the Byte article. So I found out that all 8 inhibit lines pass through the bit planes within the quadrant I used: a group of 4 lines rotated being inhibit for the first 32 X select lines (X0 with i0, X1 with i1, X2 with i2, X3 with i3, X4 with i0, X5 with i2,... X31 with i3), and similarly a second group of 4 lines rotated being inhibit for the last 32 X select lines. So what was the stack design point in splitting up the inhibit line in a bit plane into 8 segments? I guessed it was probably to cut down on heat generation: about 400ma typical inhibit current through a (measured) 7.5 ohm winding segment generates 1.2 watts per segment: 9.6 watts for just 1 of the 16 bit planes (for about 50% of the time if the memory is continuously accessed). Not wanting to build and switch among eight inhibit driver banks, I compromised and connected adjacent pairs of inhibit winding groups in series (see the red connecting lines in the Inhibit Winding Connectors diagram, above right), and added three additional driver banks to four total to drive the four effective windings in each of the 16 bit planes. The four inhibit driver banks are shown on the Inhibit Drivers Logic drawing, above center. The first is indicated by the IC locations 1U - 8U and 1V - 8V and diode arrays T2 and T6 (see Inhibit Driver Board Layout, above left); the remaining three by the included table, which shows the Location coordinate substitutions for the alpha and beta symbol markings in the drawing. 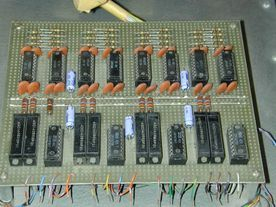 The Inhibit Control logic consists of four ganged 74157 data-selectors/multiplexers which select the 16-bit source for presentation to the inhibit drivers during the memory write cycle. the high MDR->MEM signal selects the data held in the MDR for when the write data (MDRBIT0-15) comes from the CPU, or when low selects the data (MEMR0-15) held in the sense amplifiers read buffer from a just completed destructive read cycle for a write refresh of the read data. the (low) INH ENABLE allows the selected data to appear at the 74157 outputs (otherwise the outputs are all held low). The Sense Amplifier / Read Buffer logic drawing does not have a separate Board Layout, and is missing some component information. A closeup photo of this 5" x 6" board is shown at the right. The two resistors across each sense loop are 100 ohms 5% . The pullup resistor is 1K ohms. The eight dual sense amplifier ICs are LM7524. The four quad-latch ICs are 7475. The sense amplifiers each connect to one of the sense lines of the sixteen 136 x 128 bit planes (128 x 128 used) in the 4K portion of the stack being used. The analog sense signal is fed to a differential amplifier and through a threshold detector, which converts the input voltage (either polarity) exceeding an adjustable threshold to TTL logic "1", and logic "0" otherwise. A single threshold adjustment is shared by both sense amplifiers in the dual package. On the board there are eight 200 ohm potentiometers for manually adjusting these thresholds (fortunately very seldom). I wrote the Byte article "Coincident Current Ferrite Core Memories" near the end of 1975 when the logic pieces described above were working together and the CPU (completed roughly a year earlier - with no peripherals other than keyboard) was able to execute instructions from the core memory. 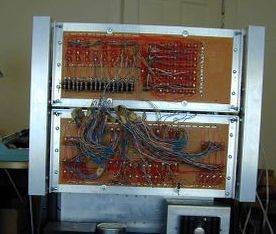 However, the memory control logic was a hodge-podge of (intentionally) temporary circuitry, built on the circuit in Fig 15a of the Byte article. So I replaced this temporary logic with the Read / Write Control Logic shown here, retaining the X and Y and inhibit timing for the "read then write" cycle, and consolidating additional logic for initiating a memory read-write cycle and indicating its completion, and generating the (low) SENSE STROBE signal for capturing the sense amplifier read data. The input signal MCLK is a fixed 2MHz clock. Input MEM->MDR going high triggers a read (data to MDR) and write refresh cycle, the signal MDR->MEM going high triggers a read (data discarded) and write cycle - these signals are expected to remain high until the MEM DONE output signal goes high (it's low while the memory is in its read-write cycle: busy).